My favorite recorded 14 minutes/16 seconds can be found at the end of Black Sabbath’s self-titled debut, the three-song blues assault known as “A Bit Of Finger/Sleeping Village/Warning.” I demand a complete absence of outside stimuli when immersed in its goings on, my attention undivided as the Bill Ward/Geezer Butler juggernaut craft one of the best rhythm sections in rock history. Bold statement? Probably, but to me there are few moments on any record that hold up throughout decades of “bigger and badder,” still managing to boast this level of strength, determination and blistering evil. 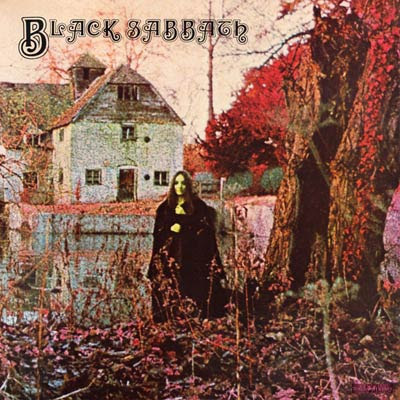 I’m certainly not overlooking Tony Iommi’s spider-ing guitar solos or Ozzy’s eerie delivery, certainly both are at the forefront as far as the Sabbath persona and the occult-ish lean they embodied so well, but Ward and Butler champion my attention with every listen. I sometimes feel as though I’d been born in the wrong era, especially when confronted by Sabbath’s debut and the idea of hearing this in 1970. “Black Sabbath,” with its clinging bells and pouring rain, inspires in me visions of frantic parents, pitching fits of protest and bonfires melting black platters in attempt to boil the potential Lucifer-mind meld out of any realm of possibility. What I’ve always found rather fascinating about the quote unquote Satan bands is that they seem to rail against violence and war. “Wicked World” basically lambastes government for allowing its people to starve or die of disease when progress has allowed for the seemingly worthless advantage of landing on the moon. Sabbath utilize darkness, but never at the expense of their humanity, which is where I think they remain somewhat misunderstood. And, honestly, you don’t get more Christian than “N.I.B.” a sympathetic nod to the devil himself that's thoughtful enough to consider Lucifer's feelings for a change. Black Sabbath's debut turned forty this year and it remains at a creative and transcendent height that few bands have been able to reach let alone surpass. God bless you, Ozzy Osbourne.